CLEAN, SAFE & HYGIENIC - THAT'S HOW WE LIKE OUR RAGS! Not all automotive and boat cleaning rags are smelly and poor absorbents - just the low quality ones! Small low cost importers often supply low quality recycled t-shirt rags without taking on the extra procedures and cost of ensuring the quality of their cleaning rags. These are the dodgy suppliers to avoid, particularly given the health risks associated with unhygienic, unwashed and non-metal detected rags! Use the supplier that large motor dealerships and car washes around Australia trust - TIDDOX! We carefully select and sort our COLOURED T-SHIRT RAGS, and then subject them to further strict procedures involving cleaning and metal detection to ensure that the finished product is hygienic and safe for use as automotive cleaning rags. 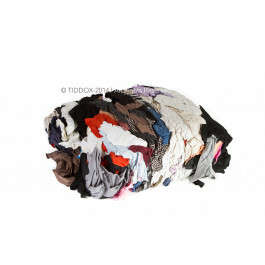 The cleaning process is rigorous, with all T-Shirt rags undergoing intense laundromat washing to sanitise and remove unwanted stains and unpleasant odours from the rags. The metal detection process is equally rigorous, and undertaken before the rags are packed into 10kg or 5kg bags. The metal detection ensures that there are no zippers, buttons or pins in the cloth that might damage a vehicle's surface. The end result are quality bags of COLOURED T-SHIRT RAGS that are ideal for cleaning, drying, and polishing vehicles, trucks and boats. TIDDOX's automotive cleaning rags are thick and highly absorbent, making them perfect for soaking up moisture, dirt and grime off a vehicle. The softness of the cotton fabric makes them perfect for polishing, and this type of fabric tends to be very low linting, so unlikely to leave any annoying residual bits on the vehicle's surface after wiping. So grab a few bags and enjoy these benefits, peace of mind and the cost savings that come with choosing a quality supplier that puts cleanliness, safety and hygiene first! Other related products from TIDDOX 's range of automotive rags, wipes and cloths include the RAG ON A ROLL, the LOW LINT INDUSTRO WIPES and the ORANGE SHAMMY WASH CLOTH.